Third among San Miguel Brewery’s big three flagship brews is San Mig Light. This beer is hugely popular among younger Filipino and expats who prefer a lighter easy to drink brew. It is marketed as a fun, youthful and playful drink as compared to the extra strong Red Horse which has a more macho style in it’s advertisement. It is in many ways the Filipino equivalent of an american style light beer. 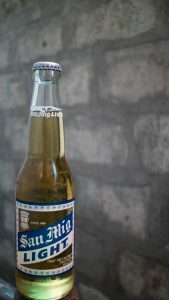 San Mig light not only has a shortened name, it also does away with the brown stubby bottle of the Pilsen, instead going for a sleek transparent bottle. San Mig light contains 100 calories per 33 cl bottle and has the same alcohol content as regular Pilsen at 5% abv. It’s light, but is it right? San Mig Light pours much like San Miguel Brewery’s other brands with a pale golden golden color a fast disappearing foamy head and lively carbonation. The smell is fairly reminiscent of its big brother Pale Pilsen. A slight malty note can be smelled but it certainly doesn’t overwhelm the senses. Flavor is, as to be expected, very mild. It has a slight mouthfeel of grains but next to no aftertaste. Overall this beer comes and goes without leaving much of a lasting impression which is what you can expect of a light beer. San Mig light is just like the two other flagship brews widely available all over the country. When visiting stores or Sari Saris out in more rural areas though they may have opted not to stock this one since it is more popular in an urban environment. A 330 ml San migbottle will set you back around 30-38 Peso while the can usually is around 40-45. Pricing of San Mig Light can be wildy inconsistent. Sometimes it’s cheaper than Pilsen, sometimes more expensive. It’s hard to discern the reason for this but usually the price difference is not too big, so just go with the one you like. San Mig Light is not a beer that caters to the beer drinker that favors a full bodied or flavorful beer. It delivers a mild flavor but when drunk cold it does not have any particularly bad flavors either. For those that favors drinkability over all other things with a beer San Mig Light is the drink of choice in the Philippines. Personally I prefer a drink with a bit more flavor to it.